When a person is on probation in Arizona, the unserved portion of incarceration is suspended until the probation terms and length of terms are successfully completed. Terms of probation usually include provisions that require a probationer to obey all laws. Under A.R.S. 13-901, if a person violates their probation terms, or is found guilty of committing another crime, the probation officer may submit a petition to revoke the probation. The court will review the petition, and may issue a warrant for to arrest the probationer. A revocation hearing will be requested to determine if a violation of probation was committed and if it rises to the level of sufficiency to revoke probation. If the probationer pleads guilty, or the court finds that relevant probation terms were violated, it may add to, or modify the current conditions. The court in its discretion may also revoke probation completely, at any time before the expiration or termination of the probationary period. If the court revokes the defendant's probation and the defendant is serving more than one probationary term concurrently, that person may be re-sentenced to serve the terms of incarceration consecutively. When probation is revoked it generally results in the original sentence being reinstated, and often times with more severe penalties. 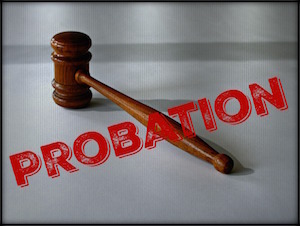 However, if you are accused of violating your probation by your probationer, or you are arrested for a crime, it does not automatically result in probation revocation. In this event, it is important that you invoke your right to retain an experienced attorney to protect your rights, defend the allegations, and to preserve your probation and freedom. Defense is needed in the least on two fronts for probation violation allegations and new criminal charges. First, the new charges will need to be defended. Then the probation violation matter will then be addressed depending on the outcome of the criminal charge resolution. The defenses that may apply to your case will be based on the unique circumstances, and facts of your case. Where a condition prohibits a person from contacting another due to domestic violence, but contact was not initiated or provoked by the other party and not the probationer, evidence to this effect can be presented. If you wish to defend your charges for probation violations, you will need to enter a plea “not guilty” to the charges, and retain a criminal defense attorney who will present your case, and protect your rights through the legal process. You have the right to retain a criminal defense attorney to defend your probation violation charges, in an effort to avoid revocation or other harsh penalties. It is important that you consult an experienced criminal defense attorney in the matter before your hearing date. If retained James Novak will make e sure your rights are protected, and provide you will strong criminal defense representation in your matter. Convictions of Probation violations often carry more severe penalties than the original crime for which the person was convicted and put on probation. A conviction will jeopardize your future and freedom for years to come, in addition to harsh penalties, can include felony criminal record, costly fines, mandatory substance abuse treatment, drug testing, supervised probation, loss of civil rights such as the right to vote, and possess firearms and other penalties. The key to a successful outcome in your case is early retention of a criminal defense attorney to protect your rights and provide a solid defense on your behalf. The chances of getting a favorable outcome in your case will increase with early investigation and intervention on your behalf by a private criminal attorney. James Novak, DUI and Criminal Defense Attorney practices exclusively criminal defense and defends clients’ criminal charges in Phoenix, Mesa, Tempe, Chandler, Gilbert, and Scottsdale, and surrounding East Valley Cities in Phoenix-metro AZ in Maricopa County AZ. James Novak is a Former Prosecutor and experienced and knowledgeable criminal defense trial attorney, who can provide a strong defense for your probation violation charges. He provides a free initial consultation for active charges in his service areas. You can complete the Contact form or call today for your free and confidential initial consultation (480) 413-1499.